Cream the coconut oil with the sugar in a large bowl by hand or with an electric mixer. Add the eggs, vanilla and Fiori di Sicilia and blend until smooth. In a separate bowl, whisk the flour, baking powder and sea salt together. Slowly add the flour mixture to the sugar mixture and then the almond milk until all is fully incorporated. Line the muffin pan with paper liners (look for fun ones), or butter the pan, if you prefer. Spoon the batter into the liners about 2/3 full. Bake in center and top racks, if using 2 muffin tins, and then switch racks after 7 minutes and bake until golden, another 6-8 minutes. Mix all three ingredients until smooth. If it feels too stiff, add a touch more of lemon juice. To glaze: dip the top of the cupcake into the glaze and then decide how you are going to eat it!! Cupcakes are one of those desserts that are so satisfying, from peeling off the wrapper to deciding how to eat it. Do you just open wide and bite down and suffer the consequential mess? Or, delicately break off a piece? Or even more civilized, cut it into quarter on a plate? It delights me to no end that I can make gluten free cupcakes that EVERYONE loves. As many of you know, Jim has celiac disease and whenever I throw a party, it is a gluten free event. These cupcakes have a “secret” ingredient, an Italian extract that is citrusy and fresh. 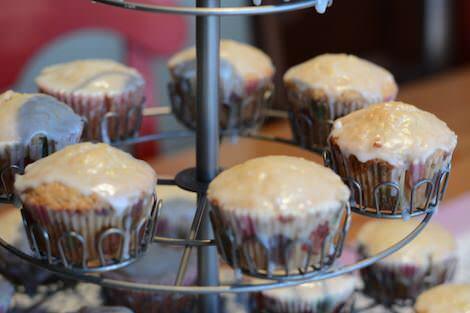 They are topped with a simple lemon glaze. Delightful and fresh! If you do not want to buy the Fiori di Sicilia, try 1 tsp of orange extract and another tsp of vanilla.